Engagement – Page 2 – Gretchen Kreahling McKay, Ph.D. This might be shorter post than usual (and it is not as nuanced as many who have written on this topic), as I am still recovering from an illness. But I was inspired to write today after this weekend another riff against laptops in the classroom was circulating on social media after Susan Dynarski posted this op ed in The New York Times. If you look at the image above ^ you will **gasp** see actual laptops in the classroom. You will also see students not looking at me, but at the laptop and each other, as they engage in an activity meant to get them looking and conversing and analyzing and interpreting in my art history class from last spring. This particular day they were asked to analyze Etruscan tombs - only the images in Powerpoint - on their laptops and offer commentary to the whole class after some time to view their images. It was a great class that could not have been done if I banned laptops from the classroom. The face-to-face time we get with students is precious. It should be valued and used as effectively as possible. I believe that using your entire time in the classroom to lecture at students is squandering that precious time. I do not believe that with the technology that we now have available that this precious time should ONLY be used to tell students things. That is NOT to say that all lecturing is bad. It is not. I have always believed that SOME lecturing is ok, if also balanced with efforts to enhance the living, vibrant, face-to-face learning situations, that precious time when we have students with us in the same space that we occupy. I do not believe in "ban all lectures!" nor do I believe in "ban all technology!" What I do believe is engaging students. It is our responsibility to do so as educators. I know that is a dangerous, even contentious statement. I don't understand how it could be. We are educators. We educate. Students learn best when they are engaged in the material. So, shouldn't we work, in all ways, to educate ourselves in how to best engage our students? There are so many options. Flipped class? Hybrid class? Discussion prompts? Twitter or other online questioning tools? Spend time experimenting and finding ways to engage your students. If you're honest with them about a new experiment you are trying, they will most likely work with you. But don't blame them if they open up a laptop because you are doing nothing but reciting material that they could get elsewhere. Be honest: don't you do that yourself in meetings in which someone is professing to you about something or other? A reminder that I give workshops and speak about active learning and this blog posts is all about active learning in higher education settings. Yesterday I was invited to run a workshop on active learning to a group of faculty, librarians, and technologists in Sarasota, Florida. It was a great experience and I enjoyed my time there immensely. During the workshop, I shared the following exercise as an example of how I would approach teaching this gorgeous painting by Jean-Auguste-Dominque Ingres (b. 1780- d. 1867) in my nineteenth-century art class. I have not yet used this assignment, but I explained how I break down a topic into an active learning experience for students. First, it is important to identify your learning goals. WHY are you teaching whatever it is you are teaching? What, specifically, do you want students to know about it? Thinking about what I want them to get out of the presentation of whatever topic is "up" for the day changes my focus from delivering facts about the image (which I could do in a lecture) and helps me think about how I could possibly get them to the answer by doing something. For this painting, I want students to come away the following: How the senses of Sight, Hearing, Touch [and maybe even Scent? or Taste?] are expressed in the image. In addition, I want them to understand the importance of this painting and Ingres as a painter to later artists. To meet the first objective, I would put students into groups or pairs (depending on the size of the class) and have them look, analyze and view the painting, thinking about how Ingres activates the five senses with specific visual cues in the painting. I would give them time to talk about them, and write them down. Then we would discuss as a class. In terms of the senses, Sight is clearly being activated because, it is a painting. But so is the sense of Touch. The textures are exquisite, from the fabric of the drapery hanging on the left, to the softness apparently on the sheets, to the flesh of the Bather as she sits with her back to us. But there is also Hearing in this painting; there is a small fountain and bath between her leg and the curtain. If you look closely, you see that the fountain is trickling with water. You can nearly hear it. The rest of the painting is so quiet, you can imagine the sound of that trickle of water. You could make a case for Scent in this painting as well, as the exotic almost wafts literally from the painting itself. The only sense that is not overtly evident is Taste, although one could make a case for taking a sip of the water, or, if the sensuality of this painting is not overt enough, kissing this bather. I would then move to this comparison to talk about my other goal for this image, which is Ingres’ importance and influence in the art world. 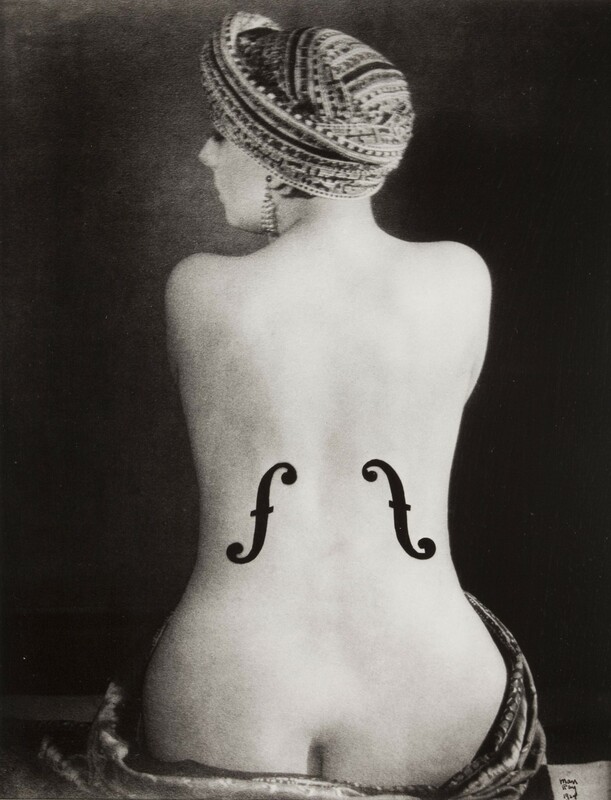 I would ask each student to write about this comparison (below): Man Ray’s photograph Le Violin d’Ingres from 1924 and Ingres' Bather. Man Ray's photograph is clearly an homage to the great painter. Each student would write individually at first on the comparison. After five minutes or so of comparison writing, I would have them share their ideas with a partner or in a group. We would then discuss as a class, with every pair or group member adding to the conversation. Conversations are always richer after giving students a chance to think first, then share with a couple of other students, and then share with the class as a whole. I would also collect their writings as a chance to see how well they are improving as writers or just a check to see where they are as writers (this is not graded). I would hope that students would see the obvious reference to the Ingres painting in the photograph. I don't want to give the titles of the painting or the photograph prior to the exercise, only because titles can nudge students into interpretive decisions, and I want those interpretations to always be based on visual analysis. But it's not only the title that alludes to Ingres directly, other elements do as well: the turban, the position of the woman with her back to the viewer, as well as, perhaps, the objectification of the woman into an actual violin “to be played” by the artist – or, perhaps, by the viewer - especially since the woman in the photograph, Kiki, Man Ray’s favorite model, is shown with no arms. It is also said that Ingres was a passionate violin player as well as painter, and the phrase "Violin d’Ingres” has become an idiom in French that means “hobby.” This last I would have to tell them. But after looking for the five senses, and then further looking and writing in the comparison, that idea is much more likely to stick with the students than if it was yet another element in a lecture on the topic. This is how I would structure this class. I have found that shifting from "lecture topic" to "learning goals" helps free me from thinking that I must provide the answer and evidence and facts. What questions might you ask of the next topic you are teaching and how might you reframe the activities in the class to get the students more involved in the learning? In the focus group that was conducted a year after the class had been taught and concluded, two students remembered this image and my instructions about the day's activities. I had sorted students into groups and then let them choose the image that they would look at, analyze, and then present to the class. I wanted them to get the class involved in their discussions, so I encouraged them to come up with a hypothesis to suggest a possible meaning. Apparently, after giving those directions, I also said, “And it’s OK to be wrong.” This was what stuck with these two students – a year later. They said that they were struck by it because they had no idea what was going on in this image. One of them said to the other, “Good because there is no way we are getting this one right.” They did not tell me this during the time of the class, but did so afterwards, when they were asked to participate in this focus group. This led to a greater discussion about the need to have assignments and activities in classes that are low stakes. Students learn from getting things wrong, but very often those “wrongs” are on high-stakes exams and tests that then hurt their overall grades. I can also see that this leads to high levels of anxiety about tests. By letting students struggle when the stakes are low, they begin to see that not having the right answer is not always the chief and most important result. In this case, I recall that during their presentation and discussion of the image with their peers, they did not get it right. They were not sure what they were looking at, since the image is more abstracted, with certain elements exaggerated from the perspective of naturalism. But they remembered this image a year later. If it had been on a test and they had to memorize it, only to have it leave their memory banks, I doubt they would have remembered this image. But because they engaged with it, thought about it, and ultimately, stood up and talked about it, they did remember it. And in that regard, they did get it right. For this case-study, students are placed in groups and each group is given their specific scenario that describes their current circumstances and situation. The scenario is different for each group, though they are divided into three types: those who are still hunter-gatherers, those who are in transition to farming, and those who have adopted farming practices wholly. After they read their scenarios, they choose cards from a deck that have “events” listed on them. In this deck of cards are events such as floods, that destroy all the seed inventory, or illnesses that wipe out a large portion of the population. Or other events happen like lessening access to animals for those that are still hunting. The choosing of the cards is random and they read the card event to the entire class. They then have time to figure out what they will do to respond, if they are even able to respond. To help them figure out their response, each group is also given at the start of this class a set of “tools,” printed on cards. They can use those tools (which can range from animals to stone tools or other objects) to solve their current predicament. They have about 10 minutes to come up with a solution, and then choose another event card and repeat the process. One goal of this entire exercise is to have students understand the difficulties in the transition from hunting and gathering to farming. In the past I had always taught rather casually that this transition went smoothly and have even – wrongly – suggested in past classes that it was somehow inevitable. Reading and using Lazrus’ game has taught me differently. And students who participate in this role-play/case-study have a chance to really experience the difficulties of the transition as they make their way through the deck of cards. The context of the movement of people versus the stationary establishment of farming communities becomes clearer through this exercise than a lecture from me about the differences. How might you adapt such a case-study/role-play model to a class in your discipline? This past week I was confounded by a number of student athletes lamenting to me personally and/or on social media about how much they "hated school." It made me so sad. It got me thinking about an address I heard José Antonio Bowen, President of Goucher College, give a few years ago about how weird it is that we, as professors, love school. Not much of the regular population does. That was confirmed for me by the echoes of "I hate school" I kept hearing our first week back. And I *do* like school. I have been here my whole life! And it also got me thinking about a book I read last summer: Susan Blum's book I Love Learning; I Hate School, published by Cornell University Press. In her book, she outlines that the myriad of services, financial and Registrar, are bewildering to students. I can't do much about that. But she also notes that students are bored in class. I know we could (and some do!) say, "Well TOUGH. It's their job to be in school and they better find a way to get interested." Or, we could yammer on about "this generation..." as if really there were better students before. Mark Carnes, in his book Minds on Fire, published by Harvard University Press, notes several passages from the eighteenth and nineteenth century in which professors lament the same things I hear from my colleagues today about students not probing more deeply, not reading enough, not thinking enough. On and on. I can't do anything about the systems that are in place that are bewildering, esoteric, and not user-friendly to our population of college students. But I can make my classes more interesting and more engaging. This blog is devoted to helping faculty think about ways to create more active and engaging classrooms and ones that still ask students to learn content. But in the activities I have developed, they also work with different people, solve problems, communicate ideas - all skills that employers say that they want newly hired employees to be able to do - without sacrificing content of the discipline of art history. Intrigued? Sign up on the right to not miss future posts!